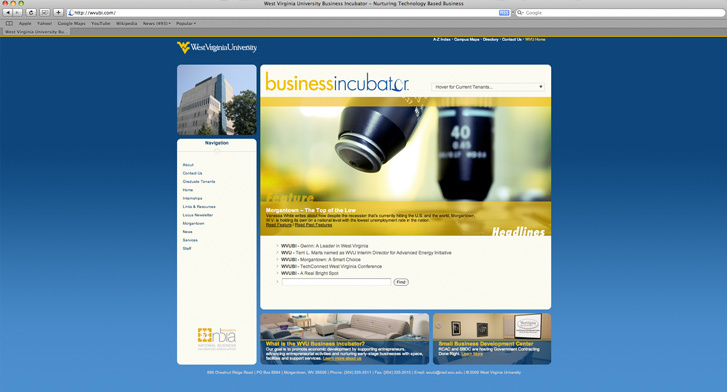 As the name implies, the WVU Business Incubator (WVUBI) helps small businesses grow. Its goal is to promote economic development by supporting entrepreneurs, advancing entrepreneurial activities and nurturing early-stage businesses with space, facilities and support services. 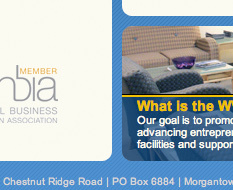 The WVUBI needed a website that was designed to appeal to a wide range of users and be easily updated. I built the website around the WordPress platform to handle the latter. For the former, I didn’t stray too far from the University’s color scheme and used several design elements from other WVU websites (the placement of the drop down navigation in the header for example). There were several elements I had to incorporate because of the Incubator’s affiliation with the University (such as the WVU header and full address on every page), but most of the heirarchy was designed based on the site’s analytical data from the prior years. Return visitors were mainly interested in site’s regularly updated, original news articles, so the homepage needed to have the most recent articles easily accessible. 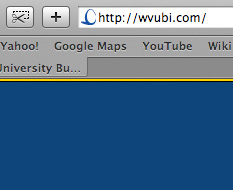 The site is still live and can be viewed at www.wvubi.com. All photographic images (with the exception of maybe two) were created by yours truely.